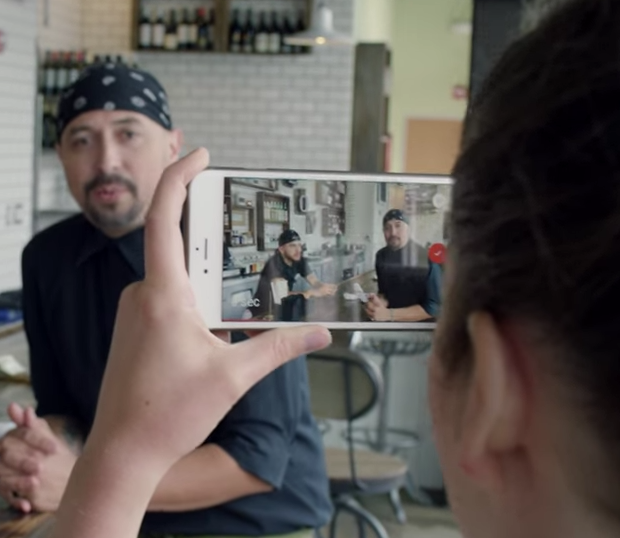 YouTube today introduced a suite of tools for business of all sizes to make video ads. At launch, YouTube Director includes three main tools that let’s businesses, especially small businesses, make video ads with a professional look and feel. The first tool allows you to create a YouTube video ad right from your phone. To try it out simply download the free YouTube Director for Business app which is available on the iPhone in the U.S. and Canada with an Android version coming soon. The app is designed for the non-techie… so go for it! Another perk for small businesses is that they can use the app to create a video without any obligation to run paid ads on YouTube. Just make the video, upload it and promote it on your small business website, on YouTube, Facebook and Twitter. To prove that anyone can make a professional looking video ad YouTube provided the example of Woody Lovell Jr., owner of The Barbershop Club in Los Angeles. Woody created his own video ad in less than 20 minutes and ran a campaign on YouTube promoting his business. Woody said that the campaign is already seeing positive results. Youtube invited The Barbershop Club and four other businesses to take part in the YouTube Director Video Challenge. They asked each owner to make a video about their business, film it, edit it and put it on YouTube in 20 minutes or less! First, they were asked to create a video ad without this new tool. They did it but it wasn’t easy. Using YouTube Director Video they were all able to create great videos in under 20 minutes using YouTube Director and couldn’t praise it enough. “It’s perfect, a lot easier and so easy,” commented the business owners. “It’s like a big budget. It’s so much better and it walked you through it giving you tips. One, two, three, four… it was as easy as ABC! It was designed well. An instant commercial. The app worked as the director. It cost nothing and it’s so easy and you can just publish it. Here’s the video made by the Pink Family of the world famous Pink’s Hot Dogs in Hollywood, California. I’ve been to this place and it’s great and you can get a vegan dog too. Keep your eyes open because this is a popular celebrity hangout! Woody did a great job making The Barbershop Club video. It really has a professional feel. The Barbershop Club is based in Los Angeles at the Original Farmers Market at 3rd and Fairfax, which opened in July 1934. As Woody says about his shop, “It is where young men come learn the ways of manhood, men come to talk with ease and both are made to look like true gentleman when they leave.” Couldn’t have said it better! Chef Roberto Martin of eLOVate Kitchen produced the video below. eLOVate is a vegan restaurant in Santa Monica, California, one of my favorite cities, and as a vegan I’ll be trying this place out! I guarantee you, non-vegans will like it too. Here’s the video ad made by Sarah Wolfgang of The Dog Cafe. Sarah started an interesting new concept of dog adoption making The Dog Cafe a gathering spot for dog lovers to meet and mingle with each other over a latte and with rescue dogs looking for loving homes. Way to go Sarah! Nadia Geller of Nadia Geller Market created a nice video ad in just 20 minutes! Nadia Geller Market is located in the Arts District in Downtown Los Angeles that carries home products with a tongue in cheek vibe. It’s part of a larger business Nadia owns called Nadia Geller Designs which is an upscale interior design firm. Nadia is somewhat more sophisticated in marketing than the other businesses YouTube chose to highlight in this product launch. YouTube also announced a service called YouTube Director Onsite, where YouTube actually will send a professional videographer to shoot and edit a video ad for any business that spends a minimum of $150 advertising. That is an incredible deal and a great way for small businesses to get started with video advertising. YouTube Director Onsite is launching in Atlanta, Boston, Chicago, Los Angeles, San Francisco, Washington D.C.—and coming to more cities soon. For businesses that are integrated in mobile apps, YouTube also announced YouTube Director Automated Video where YouTube will create a video ad from existing creative found in your business app such as logos and app screenshots already uploaded to the app store. This is available worldwide. YouTube is asking that you call one of their experts (1-855-500-2756) to try out this service.